Sometimes you want a deep, character-driven movie, with lots of hypothetical situations and Oscar written all over it. And sometimes you want to be super glued to the edge of your seat. That's exactly what "Vertical Limit," the newest release from Columbia Tristar, will do. You won't find a lot of slick dialogue, a lot of hidden messages, or a lot of Oscar nominations come February. What you will find is some old-fashioned suspense, a lot of nail biting, and some of the most daring and bravest stunt people in the history of cinema. The setting for the movie is K2, one of the highest mountains in the world, and the peak generally proclaimed by the experts to be the toughest mountain in the world to climb. Billionaire oil tycoon Elliott Vaughn (Bill Paxton, "Twister") wants to climb to the top of K2 as a publicity stunt to promote his new airline. One of the top K2 guides in the world (Nicholas Lea, who hasn't played in anything else worth noting, but did date Lucy Liu for a couple of years) and the fastest female climber in the world (Robin Tunney, "End Of Days") go up with him. Disaster strikes when a storm, which Vaughn had ignored, hits them . . . and a rescue mission is needed. 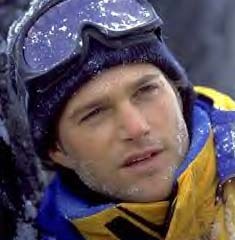 That rescue mission is organized by the woman's brother, ex-mountain climber-turned photographer Peter Garrett (Chris O'Donnell, "Batman and Robin") and led by Montgomery Wick (Scott Glenn, "Firestorm"), a man who knows the mountain better than anyone else alive. The pair are joined by a Pakistani local, a woman looking for a way out, and a pair of drunk brothers who have nothing better to do. It all makes for one wild climb up the mountain, with Garrett and Wick having painful experiences in their pasts. Several explosions, a few avalanches here or there, some ropes breaking, and one big canyon later, they get to the original climbing team, and that's when all of the individual secrets and pasts intertwine into one, and it makes for a very climactic finish. statement to believe after watching it. All in all, it's unlikely that this movie will win any awards come 2001. But maybe it should. After all, it's been a very long time since a movie has been released that can hold a viewer to the edge of his or her seat for the full two hours. As soon as one problem is solved, another arises. Just as one person's life is saved, another's is in jeopardy. 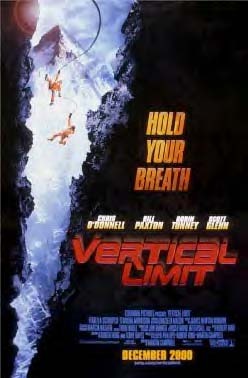 The cast and crew of "Vertical Limit" redefined what suspense in movies is all about, and that is what is going to have people coming back to watch the movie for a second and third time. our content, or have questions?